i have been wanting to add a few silk camisoles to my wardrobe for layering. i figure a silk cami is far more grown up and/or sophisticated than the ratty tanks i’ve been layering with. 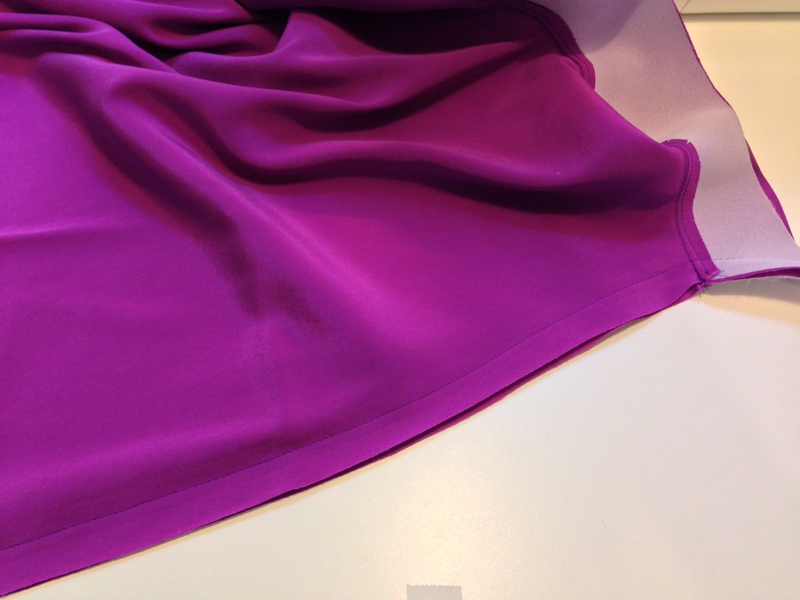 i picked up some silk charmeuse, and planned to make the bias cut camilla camisole by tessuti fabrics. what i didn’t notice when i bought my silk was that it has width-wise stretch to it. i imagine the stretch would mess with the bias drape, so i had to shelve my pattern plans and figure something else out. i looked around for a pattern, but remembered that my sewaholic saltspring has the exact neckline shape i wanted. instead of starting from scratch, i went with what i had and modified the bodice. this was really just a matter of extending the side seams, and making sure i had enough width so that it would graze my hips. i had a long think about how to finish the neckline, and in the end determined that a facing was the best route. bias binding or bias facing was pretty much out of the question, as the top stitching would have been a nightmare. 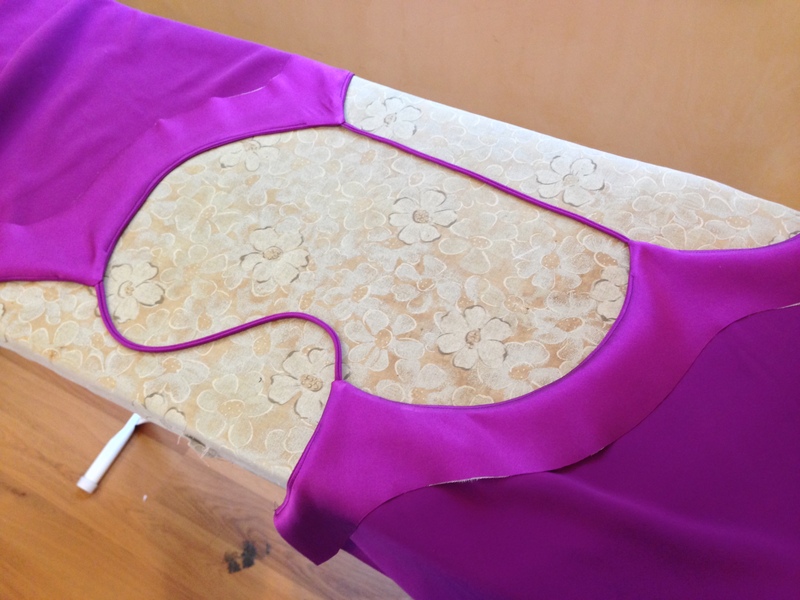 i know people get hung up over facings, but seriously—it’s the easiest way to finish a neckline cleanly. drafting it was as simple as tracing off the neckline plus 2″ or so. i interfaced the facing with a lightweight fusible, then pinked the edge to reduce any show through. as far as construction goes, i strayed from the pattern’s instructions because i find stitching all the way around the neckline in one pass to be stressful—all those up and down curves! so what i did was attach the facing to the front piece, then attach the facing to the back piece, then sew up the side seam of the shell and facing all in one pass. since i’m making straps with a fixed length (as opposed to the ties as per the pattern) it’s a little less fiddly this way. and don’t forget to trim, clip, and understitch that facing. 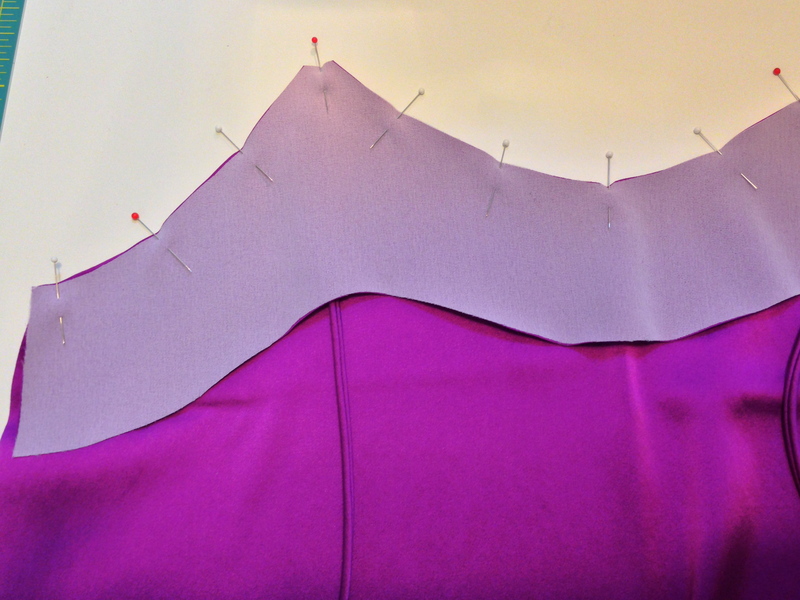 you can use this same order of construction for lining the dress bodice too, btw. after trying the top on, i went back and shaped the side seams in by 1/2″ (2″ all around). i couldn’t go too fitted since there is no closure, but it was looking a little tent-like otherwise. then i decided to finish the hem with a blind catch stitch. i planned to do a rolled hem, but the stretch of the fabric was making my test scraps (yes, i was good and tested first!) look all wavy and unattractive. i’m still not completely happy with the hem. this fabric is really not holding a press very well, so not long after pressing it starts to look a little bubbled. ah well, win some loose some. i would like a couple more camisoles in my wardrobe, so i’ll make sure to get a non-stretch fabric so i can try a bias cut. i’ve never done a bias cut garment, and i feel like a camisole is good practice. however, if you don’t think you’re up to a bias garment, this saltspring mod is a nice compromise. it would also be nice with lace trim at the neckline and hem; i definitely want to try that sometime. so far i really like to wear it with my knit blazer or a cardigan and jeans. i know some people get all worried about using and wearing silk fabric, but i say why not have a little lux in your everyday life? i pre-wash all my silk (with a color catch sheet if it’s a print) and sometimes even put it in the dryer on air dry. you’d be surprised how resilient this stuff is! but, i also don’t wash my silks after every wear; letting it hang to air out is sufficient for a few wears. then when i do want to wash it, i use the delicate setting on the wash and line dry. moral of the story… don’t be afraid of the beautiful silks in your stash. sew and wear them! here’s the post on my blazer, if you’re interested!